Exhibiting excellence in every botanical art form. The Society invites artists to submit their very best work to our open exhibition. 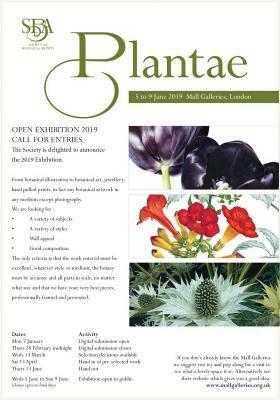 Whether an artist working in watercolour, oils, gouache, graphite, colour pencil or pen & ink, a botanical illustrator, a printmaker, ceramic artists, sculptor, jeweller or glass artist, we are seeking work with a strong exhibiting presence to be part of our show at the Mall Galleries. Our only criteria are that all work must: Be predominantly of botanical content. Be botanically accurate. Be visually pleasing. Have strong wall appeal. Be work you are proud of. All work must be original (all prints must be hand pulled and NOT giclee). We regret we do not accept photography or other digital art forms. Maximum dimension is 120cm on the longest side.